Fairly commercial pop/rock or synthpop band fronted by Paul Tiernan and Mandy Murphy. Considered at the time to have enough potential for a publishing contract with Paul McGuiness and Bill Whelan, they released three singles which don't quite bear this out. 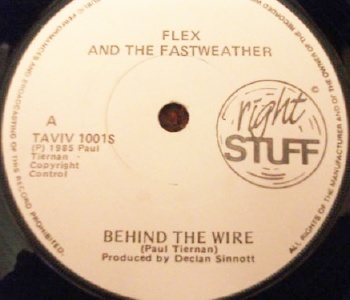 The band's debut single "Behind The Wire" came out in 1985 on their own Right Stuff label. A Fanning session followed which included a re-recording of "Behind The Wire", "The Darkness" and "Whatever Happened To Girls Like Alice". 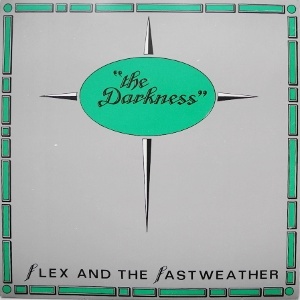 The lineup on these recordings was completed by Carolyn Fox (vocals), John Stokes (guitar), Maurice Roycroft (AKA Seezer AKA The Man Seezer) (keyboards), John O'Sullivan (bass) and Earl Gill Jnr (drums). 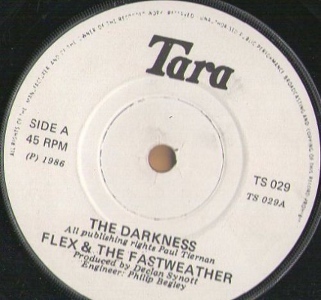 "The Darkness" became their second A-side, again with Roycroft and O'Sillivan, and Dave Whyte (ex Southpaw, etc) on drums and was released on Tara Records in Ireland and Sonet elsewhere. 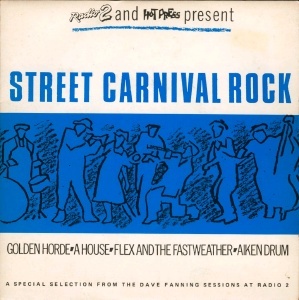 "Whatever Happened To Girls Like Alice" appeared on the Street Carnival Rock EP released by RTE in 1986. A third single "Stan" / "Rain" appeared on Right Stuff in January 1987. The band promoted it with an appearance on Megamix. Flex split sometime later. Paul Tiernan later released solo albums in singer-songwriter style while Mandy Murphy is an in demand backing vocalist. 7" - Right Stuff Records - TAVIV 1001S - 1985 - no PS? Recorded at Windmill Lane, produced by Declan Synott. 7" - Right Stuff Records - RF002 - January 1987 - no PS?